History of civilian detention in Canada particularly relevant in light of current events, says organizer. 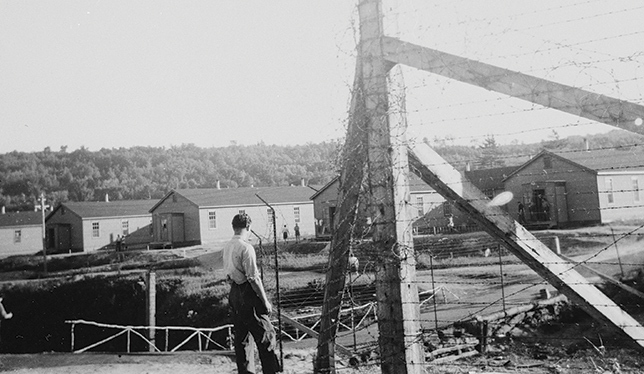 An internment camp in Quebec, circa 1940. Photo by Library and Archives Canada. Organizers of an upcoming workshop on civilian internment want to raise awareness of its history and consequences in Canada. Rhonda Hinther, a history professor at Brandon University and co-organizer of the event, says she taught a course this past fall on civilian internment in Canada and found that her students “knew very little about it. They were really shocked.” The fact that a First World War internment camp had existed in Brandon, Manitoba had also made studying internment more personal. The workshop, Civilian Internment in Canada: Histories and Legacies, is being organized by the Canadian Society for Ukrainian Labour Research and will be held in Winnipeg, June 17 to 19. It will bring together not only scholars and researchers but also individuals and families directly impacted by internment on Canadian soil. The need to hear from former internees and their descendants is becoming more urgent, as these individuals age and pass on, says Dr. Hinther. Attendees will explore internment episodes during the First and Second World Wars involving mainly people of Ukrainian, Japanese and Italian descent, but they will also hear about topics related to the experiences of conscientious objectors (Mennonites and others), leftists and Communists, the October Crisis, and the detention of people without charge during the G20 meeting in Toronto. Dr. Hinther and her research collaborator Jim Mochoruk, a history professor at the University of North Dakota, plan to collect and edit the articles, materials and testimonials from the workshop for future publication. It will offer “multiple perspectives on interment from a variety of communities that experienced it,” she says.